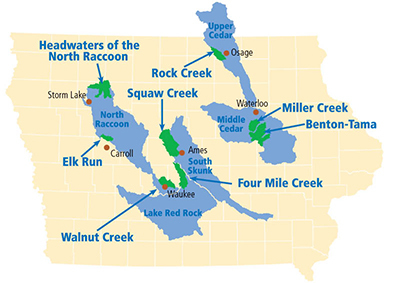 The Headwaters of the North Raccoon River project is located in northern Iowa’s Buena Vista and Pocahontas Counties. Managed by those two counties’ Soil and Water Conservation Districts (SWCD), the project is working side-by-side with local farmers and partners to promote management techniques, land use changes and edge-of-field practices outlined in the Iowa Nutrient Reduction Strategy to decrease nutrient loss and improve water quality. Situated in a highly productive agricultural area, 85 percent of the watershed is in row crop production. Farmers, trusted agricultural advisors and retailers are working together with SWCD experts to demonstrate, adopt and evaluate practices. In addition, the project works with their urban counterparts through the City of Storm Lake. The project is unique in that it targets four adjacent watersheds and has an active advisory team consisting of ag retailers, city leaders and farmers.